Sticky tape leaves an adhesive residue in your hair, if it gets stuck. Removing tape from your hair is difficult because your hair gets pulled as you take the tape out. 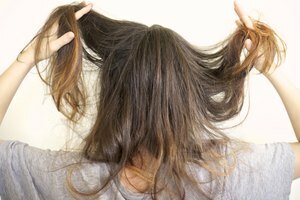 Adhesive left behind on your hair causes hair to clump together and eventually form a knot. Remove the residue using some of the same techniques you would use to remove it from other surfaces. Apply olive oil to your hair, where the tape residue is stuck. Coat your hair with the oil to loosen the sticky adhesive. Warm the oil on your hair, by heating it with your hairdryer. Hold the hairdryer 12 inches away from your hair for 30 seconds to heat the oil. Allow the oil to remain on your hair for a few minutes. Brush through your hair with a fine-toothed comb to remove the tape residue. Wipe the remaining olive oil off your hair with a washcloth, so you can see how much residue is left. Repeat Steps 2 and 3 until the adhesive is completely removed. Shampoo your hair to remove the olive oil and the last of the tape residue. Substitute baby oil or mineral oil for olive oil, if necessary. Dab your hair with warmed vinegar on a washcloth to loosen the tape residue. Stand under warm water in the shower and rub hair conditioner on the tape residue to loosen it. 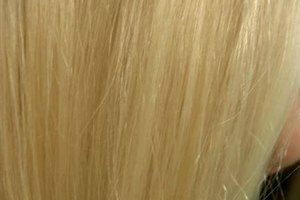 Why Does Hair Absorb Oil?